World Today News: In 2019, will we escape the announced recession? In 2019, will we escape the announced recession? The year 2018 had begun in euphoria. In early 2019, the time is pessimism. International institutions cease to warn against the multiplication of risks. The high volatility of the stock market indices on Wall Street as in Europe, after a very gloomy end to the year, fears about the trade war, the economic slowdown in developed countries, the rise of populism fuel worries. In the United States, the specter of a recession is gaining ground. Economists and investors are looking for a possible reversal of the yield curve (when long-term rates fall below those in the short term), which would be the harbinger of a worst-case scenario. In China, the industry experienced its first contraction in nineteen months. This slowdown has had repercussions on other Asian economies such as South Korea. However, economists refuse to panic and most forecasts of major institutions stress that the slowdown expected for the coming months does not necessarily announce a more violent contraction of activity. Global activity seems to have reached its peak in early 2018. According to forecasters at the Organization for Economic Co-operation and Development (OECD), global growth is expected to slow, from 3.7% in 2018 to 3.5% for 2019 and 2020. The traditional drivers of growth have clearly slowed down and activity is becoming less and less synchronized between countries. "Macroeconomic policies should become less accommodating over time, and trade tensions, hardening of financial conditions" should continue to weigh on activity according to the OECD. Less pessimistic, the International Monetary Fund (IMF) announces that global growth should reach 3.7% for 2018-2019, a stable level compared to 2017. The international organization has still revised downward growth forecasts in the year 2018. This revision is due to the unexpected slowdown in activity in some major developed countries, but also to the adverse effects of the trade measures applied or approved last year and a deterioration of the outlook for some emerging countries. In the medium term, the horizon is far from clear. For its part, the World Bank forecasts growth of 3% in 2018, 2.9% in 2019 and 2.8% in 2020. According to the growth forecast consensus cited in the latest OECD report, global GDP growth is expected to average 3.5% per year over the next decade. Prior to 2008, economists anticipated global annual growth of between 4% and 4.5% per year. The braking is so serious. Of all the developed countries, the United States remains very much watched by economists. According to the OECD, growth is expected to slow down, from 3% in 2018 to just over 2% in 2020. If the increase in public spending, the good health of the labor market could have contributed to support the domestic demand, the rise in tariffs has begun to weigh on the costs borne by businesses. For Florence Pisani, director of economic research at Candriam, an asset management company, this trade war "Will lead companies to reorganize the production lines that had internationalized. There will be relocations, there will sometimes be renationalization of these production lines [...] If it continues, it may lead companies to postpone their investment plans and delay hiring. In addition, the United States is in its ninth consecutive year of economic growth. What constitutes a relatively long cycle of expansion and this pace appears to be difficult to sustain, especially as the labor market is experiencing a full employment situation. The considerable drop in taxation, symbol of Trumpism, and the exhaustion of the fiscal stimulus could aggravate the economic situation. On the other side of the Atlantic, the press is multiplying some of the risks of a recession. The strong volatility of the stock market indexes in December caused cold sweats on Wall Street, which started the year down after having recorded in 2018 the strongest correction in ten years, including technology stocks that had reached the peaks probably unreasonable. (More than 1,000 billion capitalization for Amazon and Google, back down since those records). In the euro area, forecasts have largely been revised downward. The average growth of the Monetary Union slowed in the third quarter of 2018 to 0.2% against 0.4% in the two previous quarters. According to a recent Bulletin of the European Central Bank (ECB), the slowdown observed in the third quarter is largely due to external factors, in particular the weak external demand with lower exports compared to 2017. European industry has been clearly penalized by this erosion of order books worldwide. The crisis of 2008 left important traces. Differences in living standards have worsened, preventing real convergence within the zone. Southern countries, such as Greece or Portugal, are still far from having recovered their standard of living before the crisis, while Germany or countries with favorable taxation, such as Ireland or the countries - have continued to grow rich. In addition to external factors, this braking "Is linked to temporary bottlenecks in car production in Germany". The introduction of new anti-pollution standards in the automotive industry on September 1 may have helped to curb activity, but that is not the only reason. INSEE economists recalled in a recent press conference that "German manufacturers have struggled to anticipate the entry into force of anti-pollution standards, tightening the approval rules for new vehicles". For the head of the business cycle at INSEE, Julien Pouget, this slowdown "Is not only due to the difficulties of adapting German automobile plants to the new anti-pollution standard. " "The activity of the main countries of the euro zone would be close to their potential. The dynamism, associated with the catch-up following the 2008 crisis and then with the 2011-2012 sovereign debt crisis, is about to fade. This does not mean that growth stops but that means that growth returns to something more trendy. In Germany, the economy experienced a real blow with growth of 0.2% in the third quarter of 2018. 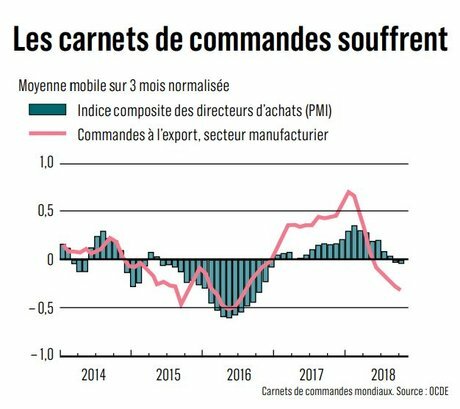 In France too, growth has clearly slowed down in 2018. And if the movement of "Yellow Vests" weighed on activity at the end of the year, the braking was already visible in the first half. With the measures announced by Emmanuel Macron on December 10, purchasing power could rebound strongly throughout the first half, according to INSEE economists. In addition, the fall in oil prices should make purchasing power still available to households in Europe. The election of Eurosceptics in Italy had raised many fears. A few months after coming to power, tensions seem less visible. "It's time for appeasement. Italy is in a situation where its deficit is less than 3%. Overall, the measures announced should not push the deficit above 3% in 2019. There is certainly a radically different direction from the government compared to the previous one. The worry about Italy remains the debt. If rates stay contained, debt should not increase »says Christophe Blot, deputy director of the analysis and forecasting department at the OFCE. Overall, even if there are risks, "It's a slowdown but there's no Italian shock on the eurozone", recalls Christophe Blot. But just a few months before the European elections, the uncertainties remain high. On the Japanese side, growth is expected to be around 1% in 2018 and 2019, in a context where corporate earnings and significant labor shortages are expected to boost investment, before slowing down. 2020 estimates the OECD. 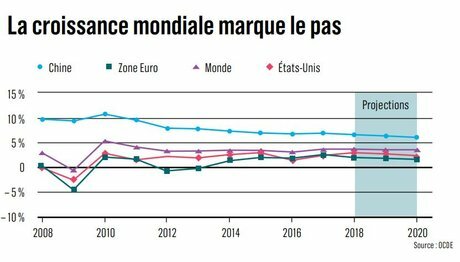 In emerging economies, forecasters at Château de la Muette, the OECD headquarters in Paris, anticipate stable growth over the 2018-2020 period, even if this result conceals serious differences. In India, robust domestic demand, boosted by a broad infrastructure program, is expected to maintain growth at close to 7.5 percent in 2019 and 2020. In Brazil, the recent takeover of far-right leader Jair Bolsonaro on January 1, feeds economic uncertainty after two years of disastrous recession. The former soldier promised to turn the country around. To do this, the new president has entrusted the reins of the Ministry of Economy to Paulo Guedes, a fervent supporter of ultra-liberalism, to lead among other things a vast privatization program throughout the country. After a sluggish economic activity in the first half of 2018 and multiple social movements, growth regained momentum in the third quarter. But the Brazilian situation remains tense. Inflation has increased significantly with the depreciation of the real in the context of political tensions, thus penalizing the purchasing power of Brazilians. The IMF expects GDP growth in the next two years, rising from 1 percent in 2017 to 1.4 percent in 2018 and 2.4 percent in 2019, even though the organization has revised its numbers downward. Turkey and Argentina have experienced severe financial turbulence in recent months. While these tensions may have caused some concern in the markets, the risks of contagion are relatively limited. "The financial tensions in Argentina and Turkey do not necessarily represent systemic risks for the global economy, given the financial and commercial ties that these two countries have with the rest of the world", points out the forecasters of the OECD. After an exceptional 2017, the pace of world trade should slow down. According to the OECD, trade growth should rise from 4% in 2018 to 3.7% in 2019if trade tensions do not get worse. On the side of the World Trade Organization (WTO), the indicators are red. Global trade growth may be at or below the growth of the global economy, while the opening of China and the former USSR member states boosted trade. At the start of the year, trade tensions between China and the United States have been paused. Last December, Donald Trump and his Chinese counterpart Xi Jinping agreed on a truce so as not to apply new customs duties on January 1st. But the US president's flip-flops and his attachment to protectionism could revive this battle. In this context, international trade should remain sluggish according to ECB experts. Although the impact of tariffs has been limited so far, "It should affect trade between the United States and China". 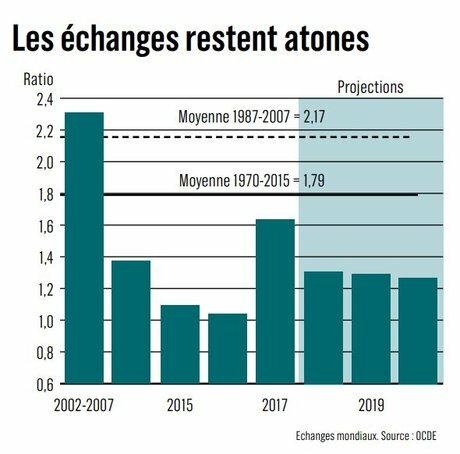 For INSEE, "We would observe a one-off acceleration at the end of 2018 in anticipation of reprisals related to the increase in customs duties announced in the first half of 2019 by Donald Trump". In addition to the trade war, many tensions on the international scene could have repercussions on the global economy and the financial markets. More than two and a half years after the Brexit referendum, the political situation in the UK has worsened. In 2018, endless negotiations took place between the EU's chief negotiator at 27, Frenchman Michel Barnier and the British government. These talks did not result in real unanimity. Theresa May has postponed the vote in Parliament on Brexit on 14 January. For the head of the government, this election appears as that of the last chance before the fateful date of March 29 and when the discussion on the organization of a new referendum is gaining ground. In the United States, geopolitical issues are of concern to the panel of economists surveyed by think tank BSI Economics. Donald Trump's diplomacy and its calling into question of multilateralism come at the top of the list of concerns. The increasing risk of instability on the international scene could further obscure the economic prospects of a vulnerable planet.